Why Do Real Books Cost Less? I'm really just curious. As I look at eBook prices, they seem to be a buck or two more than the same book in paperback, and that doesn't account for the cost of the eReader itself, no matter which one you choose. So why is this? The publishers already have the text in electronic form. Formatting it for an eReader is surely a rather small effort. Then, to get it to me costs them very near nothing. To get me a paperback has to cost more. First, they have to MAKE it. Then someone has to ship it to somewhere I can get my hands on it. So how can that be cheaper than just sending me a file over the Net? And once I have the eBook file, can I lend it to my friends? It seems to me that there might be something wrong with this pricing model. I take a train to work almost every day. A few times a week, there are announcements about not leaving garbage on the train and taking all your stuff with you. Sometimes they specifically mention newspapers. I think some people might think that if they leave their paper on the seat, some other person might get some use out of it. I find that to be a bit of a gray area when it comes to what's acceptable behaviour and what isn't. 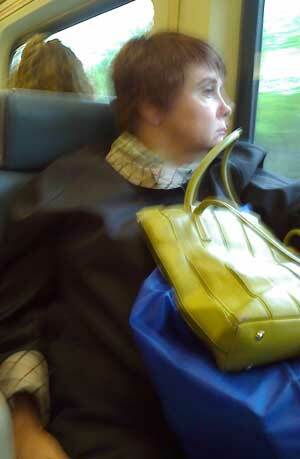 As the train made its way along, she was sitting in her seat with two newspapers in her hands, reading away. When done with the first, she just chucked it on the ground in front of her, as though that were the most natural place in the world for it. She didn't leave it where someone might use it. She didn't recycle it like some civilized person. She just chucked it on the ground, obviously thinking that the world is her personal trash can and that someone else should clean up after her. It's mostly irrelevant, but it's worth noting that the seat next to me was empty, so if she had the slightest inkling that someone might use it, I expect she'd have put it there. Instead, she just chucked it on the floor for someone else to deal with. My first thought was that maybe I should say something. Maybe I should point out to her that she had "dropped" her paper and perhaps should pick it up. My morning lethargy got the better of me though, and I just wasn't in the mood to make a scene. 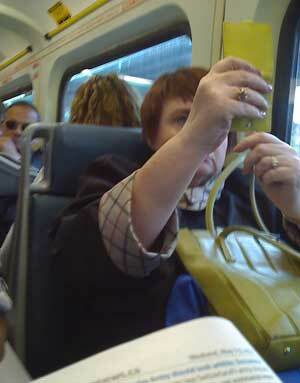 My next thought, then, was to take her picture and publicly shame her. I figured, I've got my own personal media outlet with a global audience (of at least 3 people), so why not use it to do some good? The problem with that, however, was that she still had her second newspaper up in front of her, so it was obscuring any opportunity to snap off a couple quick pics. I'm sure you can guess what happened next. Sure enough, she chucked the second paper onto the ground, to join the first as some maintenance worker's unnecessary bane. It was too much to resist, so out came the camera phone. So my question to the readers is this... firstly, do you know this woman? I'd love to get a first-hand explanation of why she finds it acceptable to just chuck garbage on the floor of the train. Is she perhaps a member of high society, whereby it is the duty of the legions to pick up after her? Is she perhaps mentally handicapped and just not know any better? Is she physically unable to carry the heavy weight of two newspapers the 20 yards or so to the nearest recycle can on the train platforms? If so, how did she get them to her seat? Were they there when she got there? Secondly, what do you think of people who litter in public spaces? Are they doing society a favour by keeping other people employed to pick up after them? Are they just inconsiderate slobs? Do you think their mom's didn't hug them enough as kids, or teach them any sort of manners? For me... I'll just look at them in disgust and expect that Karma will have some way of evening things out for them. And here she is again, prettying herself up. I guess she's not expecting mobile beautician to drop by and take care of this for her. I went to get lunch from a street meat vendor near my work. It's cheap, and hasn't made me sick yet. Win win. Unfortunately, it's not as cheap as it was. After dressing the "food", I went to grab a drink from the cooler as I always do. The guy stopped me. Apparently now it's 50 cents for a drink. It's been free for ages. I guess it couldn't last forever. Then, as I went back to work, I found $20 lying on the ground. Next 40 drinks are free to me!